The Ministry of Health (MOH) and the Belize Tourism Board (BTB) have partnered with the Caribbean Public Health Agency (CARPHA) to protect visitors from the scourge of Zika and other diseases like Chikungunya and H1N1, by launching the Belize Tourism and Health Program at the Radisson Fort George Hotel last Friday morning, October 21st. Minister of Health Hon. Pablo Marin cited that protecting the health of Belizean tourism staff was key to the continued success of the industry, which is all important to the country’s economy. Equally important is to ensure the health of tourists that they may enjoy their stay in Belize without contracting any illness, nor introducing any infectious virus to Belize. 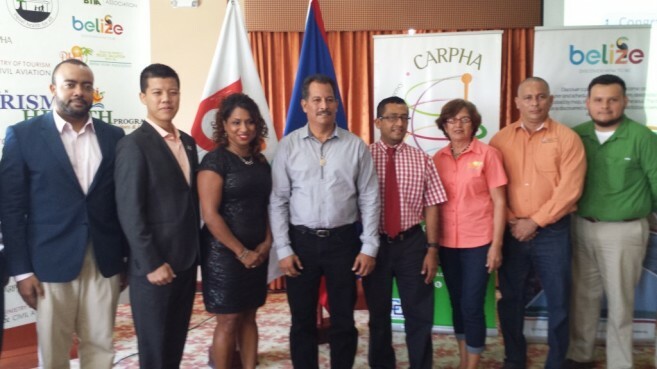 The CARPHA labs in Trinidad have been key to verifying cases of dengue, Chikungunya and Zika, so it was only natural that Belize should partner with CARPHA to fight these threats. The program will require hotels to voluntarily cooperate in surveillance and monitoring of their guest’s health, to build up a data base of guests’ health information, so health authorities may get an early warning of possible threats. The program calls for hotel and restaurant staff to be trained and certified in food and environmental safety, to avoid possible cases of food poisoning. The will also be a general certification program for hotels and resorts to meet defined health, safety and environmental standards. The program will also monitor and ensure the health of the tourism work-force to avoid the possibility of host to guest infection, and vice versa.